Below I’m going to “unpack” Brian’s post a bit, and inject some thoughts that came to mind when reading it. The reason for this is to foster dialogue. We’re in the middle of a transformational age, and in order for us to effectively co-create new models of operating, we need to have a shared language. It’s not about who’s right or wrong – it would be incredibly small-minded to put an individual down. Instead, I want to show that different perspectives on these ideas/terminologies exist, and we should acknowledge and talk about what we’re actually trying to say and where we’re trying to go. It’s important if we want to make progress, so here we go. The convention for creating financial opportunities is evolving and changing the way we seed prospects, promote our expertise and prowess, and connect with those who can help us learn and advance through the facilitation of strategic and mutually beneficial alliances. translation: There are emerging methods for exploiting connections in order to make money, promote ourselves, and get ahead. ok so far…..
Digital capitalization is laying a foundation for expanding the need to cultivate and participate, not only in the real world, but also in the online networks and communities that can benefit us personally and professionally. translation: Participation in social networks is required in order to capture potential market value. ok…. In an era of democratized publishing and equalized influence, it can be said that engagement and participation are a new, powerful and effective form of “un” marketing. At the very least, this is an epoch of empathy. Social capital is a strong ally, an elite catalyst for lucrative relationships, and now a metric for qualification, consideration and ultimately success (however you define it). This is a state of human economics that is thoroughly discussed in Tara Hunt’s book, The Whuffie Factor. Our “Whuffie” or social capital and intellectual assets are defined by both online and real world conduct and its “balance sheet” is available for anyone with a web browser to review, assess, and analyze. The thing is, to me this sounds like describing reputation, not social capital. I believe the idea of social capital was first proposed by Marx back in 1867, but I’m not even going to pretend to be able to speak to his writings. Socioeconomic theory is not my forte. Instead, I’ll skip ahead to three modern social capital theorists – Coleman, Putnam, and Fukuyama – and their definitions. I’ll build this out a bit more, but based on these quick definitions, it becomes apparent that social capital and reputation are not equivalent things. Social capital is something embedded within networks, not something directly tied to an individual’s status. Moving on. Second point: Using those quantitative words (metrics, balance sheet) leads the reader to the conclusion that this is something that we will want to measure. Let’s put aside the term social capital for a moment (since social capital is immeasurable) and look instead at what they’re talking about – reputation. If we decide that reputation is the new “currency” of the social economy, and decide to attach a number to it, I’m going to suggest that that would undermine the entire premise itself, instead resulting in commodity fetishism. (Neither Solis nor Hunt directly suggests attaching a number to it, but I’m just pointing out that if we talk about this using economic words, people will be led to develop it accordingly.) I’m just trying to think ahead here. What Hunt is trying to promote is a return to human-centric practices in business and leading from underlying human values. (One of the tweets she sent me was a link to this post of hers, which indicates as much) I think that’s what we’re all trying to do – I’m just cautioning that people may abuse this premise if it’s meaning is cloaked in economic metaphor. Like any form of capital, Social capital rises and falls with the market and the individual to which it’s governed by the state of the industry and affected by the state of corresponding affairs. As it escalates, however, it unlocks opportunities that are commensurate with the community’s assessment of its value. In the same regard, the community will not support or reward lackluster, opportunistic, also-ran, or hollow engagement in the long term. Again, social capital is measured by individual value and collective perception. I have to disagree with this. One of the characteristics of social capital is that it does NOT deplete with usage, and so I don’t connect how it “rises and falls with the market and the individual.” Then the last sentence, “social capital is measured by individual value” is also incongruous, because by definition social capital is not an attribute of individuals but a function of the relationships between agents. That’s a lost opportunity for *actual* growth and change. Talking about social capital is about having some pretty deep philosophical debates about the underpinnings of how we want to operate as a society, and the values we seek to emulate. How do we up the ante, engage in some plain talk, and push this conversation forward? Great post, Venessa. Perhaps focusing on what will be fed via capital (of any sort) may be helpful. If social capital feeds stomachs and enriches minds, then it reflects the global network of social media. If social capital feeds ego and reinforces a separate-self viewpoint (me vs. you), then it’s the same old fragmented, hierarchical game that causes social conflict, isolation, oppression, pollution, and many other problems. I completely agree with you that the idea of social capital should not be reduced to reputation. This diminishes everything and everyone to perishable commodities, as valuable as yesterday’s newspapers. Social Media implies people communicating consciously . If we lose the consciousness and just trade on the media, we will waste the great opportunities the new media offers. Venessa, keep seeing through the illusions and sharing the truths you find. You making a great contribution. Tara mentions on her blog that as she was giving presentations to business audiences, their questions were ‘so how do we leverage whuffie to make money?’ you don’t “leverage” a human value system. (unless by leverage you mean to agree to collectively decide to share and cooperate and reciprocate in order for the advancement of the greater good…… but i don’t think that’s what the business people mean when they say leverage). the whole thing becomes unnecessarily complicated by trying to convince business people to be “good” via using economic metaphors. Thanks for bearing with me. I did just jump in without thorough know of the subject. But it clarifies the need for using new terms to express emerging ideas. Having to explain that “capital” doesn’t mean capital is not skillful communication. It’s a challenge to see a new form clearly and describe it with appropriate language, but it’s an essential task in the work. Using old language for fresh ideas, as McLuhan suggested, is like trying to drive down the road while always looking in the rear view mirror. You are getting at the heart of the matter. The confusion is more about the term capital than the term social. For me (an MBA/tech consultant who likes biological metaphors for business,) it simply means the potential economic energy available to get something (really anything) done. This energy doesn’t have to be financial, but that often helps. When referring to social capital, it’s the strength, trust and connectedness of the network, as well as the network’s access to addtional forms of capital (and just about anything else available to the network) that can make things move – build bridges, feed starving nations, or simply make a buck. It’s how much influence would you have within your network to get something done and move things forward. The strength of connections/relationships will vary (resonate differently) depending on the topic, project (value, intended outcomes) and amount of funds at hand. Your reputation will certainly affect other people’s willingness to get involved or expend their own capital (time, money, energy) toward a goal, but it’s not the only thing that will determine one’s ability to get things done. “since social capital is immeasurable” I don’t agree that in principle it can not be measured. The important point is that if it can be measure, there is no way to manage it in the service of growth. My bet is that the metrics include speed and responsiveness of exchange. In a world of social media information exchange can be directly managed. Before the era of the internet, exchange is best measured by the exchange of money. If one uses finance as a lens to understand history, things previously confusing becoming more clear. Money can be seen as a defined measure of time. ( This may be what Marx is really saying.” The value of an object or service is a function of the time invested to produce it. The exchange value is what someone else is willing to pay for it. At any rate I think you raise an important point. The way I read your piece it’s the “stuck in his thumb and pulled out his thumb” problem. Just because an idea is new to me, that doesn’t mean it’s new. In fact it might well be accurate to say that there are no new ideas. What is new is how those ideas are applied in new circumstances. As you point out, social capital is a rich deep concept with a long history. For my money Jane Jacobs in almost anything she’s written has it most right in the fields of economic development, wealth creation and what it means to be a human living in a group. how would one measure social capital? if social capital is akin to “the fabric of society” or ‘social glue’ – how do you measure its stickiness? i don’t see how you can. you can measure the emergent results of a nation’s social capital – for example, how the society operates, as an indicator of its underlying social norms and values. based on that, it would seem that the U.S. is weak in social capital, as the underlying values of its people are not aligned with what is rewarded in actuality. i think that’s the bigger picture. we’re a sick nation, and our ability to function is plummeting because you can only exploit a people so much. we’re reaching the tipping point of it being intolerable. “if social capital is akin to “the fabric of society” or ’social glue’ ” I think that while social capital is a complex reality, new tools and thought models make it measurable. Metrics do not fully capture reality, but consistent metrics give some information that can be thoughtfully analyzed. “how do you measure its stickiness? ” My bet is using some of the same tools and thought models thatare being developed in SEO. “the U.S. is weak in social capital” Given the number of voluntary organizations and cities I must disagree. The problem is legacy legal and power systems that only now are allowing the bubbling of exchange on the ground in the real world to come through. eg. Jobs in the States are created by business with less than 100 employees. But this is a much longer convo, so I think best to save it for a different time. You are leaving a really basic premise of Hunt’s thesis, that social capital arises when money no longer exists as the primary currency. I think I have that right, and I may be over-generalizing. Solis is building on that, and, I think, extrapolating it to the point that social capital fills in the gap when currency ceases to exist. Only, he’s giving it all the attributes of currency, which arguably, it is not. I wonder if this whole thing is a post-modern way of muddling through a return to barter economies, where social capital / reputation is the only form of real currency. It seems a worldview couched in a fear of apocalyptic economic endings, which I don’t think will happen. It’s not overt, but I wonder if this is just the kind of fear/greed angle that used by marketers like Hunt (that’s what I think of her, a marketer marketing her self non-ironically by using the self-referential web). first off – the point is that social capital and reputation are not interchangeable words, so anything that’s built on that premise is incorrect/misleading. re: “social capital arises when money no longer exists as primary currency” – no, social capital isn’t interchangeable with money. the definition of social capital is more akin to a human values system – it represents ideas of trust, networks, reciprocity, social norms. it doesn’t replace money. in fact, the social theorists (like Fukuyama) describes it as a precondition for economic prosperity. this is my frustration. we can’t even have a conversation about this because we don’t have a shared language. we’re using the same words but they have different meanings to different people. so it becomes impossible to have intelligent discourse. Consider that another way to think about social capital is not what people believe, but rather what they do and what are the inferred beliefs and values that one can posit from observed behavior. If humans are framed as isolated species, not yet fully evolved on a strange little planet, others would try to figure out what does what they do mean about what they think. I think you misread what I wrote. My point is that Hunt said that social capital replaces currency. I am not saying this. Go to Hunt’s web page and listen to her video. I’m not misusing anything. I am simply talking about what other people talk about. In fact, if you read more carefully what I wrote, I think you would find that you and I are having the same conversation and we are in agreement. yeah, i am agreeing with you too, lol. i’m saying – social capital can’t replace currency. by definition, it doesn’t make sense. if social capital means “an embedded value system of a people,” how do you exchange that? i’ll trade you 3 compassion points for 7 cooperations. huh? so let’s forget social capital, and replace it with “reputation”, which seems to be what whuffie is supposed to be. are we going to exchange reputation points as a currency? what does that even mean? (that gets back to the brief mention of commodity fetishism – placing an inherent value in something not directly tied to labor value). and if we DID somehow create a system of giving an exchange-value to reputation, my question is – would that just be gamed in the same way money is? how do we earn more reputation? do you do it through positive social actions, and in which case, who’s going to decide the value of a social action? doesn’t that sound scary that instead of being cooperative, friendly people because it’s satisfying as a human to be so, we’re doing it to increase the score of our reputation so that we can use it for trade? it seems to strip you of human agency – you know longer have a choice in how to act, you’re doing it for the money. which is exactly the system we’re already in, don’t you think? Yes, scary. And yes, that is already the system we are in, but on the rise thanks to the overwhelming rise of “social network marketing”. Social capital as you describe it includes the concept of altruism, as something given to the community to sustain it and help it grow. Altruism seems to be a difficult and/or foreign concept to many who are trying to build their reputations and get their share (or more than their share) of what society has to offer. If altruism was a primary concept & tool of modern society we would not be having this conversation. I agree with Anthony. I also think that with any human system there will be those who want to measure it and reduce it to numbers, and those who want to use it to further their own ends, as well as those who use it to build and grow societies, as well as their own relationships. And there will be those who are left out. I live in hope that we will mature beyond “me-first” impulses but don’t expect that to happen soon! Keep this discussion going Venessa! More power to you! “your social capital” is a bit of a non sequitur. you can’t have personal claim over a property embedded in a network. I think that you can own things that live partly in the commons, in the network, if you make the most logical home for that value and energy. the ownership would be in the sense of being able to rely on that resource; that if you continued to act as a good host, it would most likely stay around. there has to be some persistence of relationships in the network, based on conditions of connection. and that’s where all the social capial as business technique thinking comes in. When I named our conference I was aware of the regnant meaning of social capital, but used the word capital to link it to markets, but then make people think twice about how the word social fit in; so it’s a bridge translation kind of set of words. that purposeful difusion is why i was able to make the tagline: at the intersection of money and meaning credible. our goal was to create a new space, between giving and investing; as rigorous as investing but with the heart and motivation of giving. a hybrid space in our current culture framing so i used a string of words that lived in two different worlds to create the bridge. Great piece, Venessa, and one that’s voiced many of my concerns around ‘Whuffie’ and social capital. I’ve watched several people make the mistake of thinking that Whuffie (as described in “Down & Out In The Magic Kingdom”) is a tradeable commodity, by direct analogy with money. It isn’t: it’s an outcome of a fundamentally different concept of ‘the economy’. Our current economic model is based on possession. It’s essentially based on exchange of physical objects, using alienability (if I give it to you, I no longer have it – hence ‘scarcity value’ etc). From this we get a barter-economy, followed by a money-economy as a standardised form of barter. But it doesn’t work. It doesn’t work properly even with physical entities – there’s no way to make a possession-economy sustainable in the long- to very-long-term, as we’re all discovering right now. And it doesn’t work at all with non-physical entities, such as ideas, information, relationships or commitment – hence the constant kludges and outright fraud needed to try to make so-called ‘intellectual property’ viable. The alternative is based on responsibility and commitment. Tara Hunt alludes to this, somewhat inadequately, in some of her ‘Five Principles’. This is also the type of ownership we mean when we talk about ‘project owner’ or ‘process owner’. And it’s also the underpinning concept in many traditional societies, such as Australian aboriginal or the Potlatch peoples of the US Pacific Northwest. Bubbling away behind many mistaken ideas about ‘social capital’ is the same mistake in that well-meant yet dreaded phrase “our people are our greatest asset”. People are not ‘assets’ – or rather, the only time when they are is when they’re slaves. The asset is the relationship, without which there is no ‘access’ to the person – and it’s a genuine business-asset that needs to be managed as such. Yet that ‘asset’ exists between two entities, and is the full responsibility of both parties. Hence it cannot actually be ‘traded’ direct to another entity – a fact which many marketers have failed to learn from the dot-com crash. Doctorow’s ‘Whuffie’ is in essence a metric of respect, enabling attention, enabling availability of transactions in the intersecting components of the market (goods, conversations, relationships, purpose). Possession doesn’t actually come into it at all. Hunt and Solis’ concept of Whuffie tries to start from the far end of the possession-economy add-on, as if Whuffie is a form of money. They then try to run the whole sequence backwards – which doesn’t make sense at all. What does work is to remember where it all starts from, in people – which is, I think, the main point of your post here? thanks for the thorough response! and yes, the main point of the post is that it starts with people. (and i think that’s what hunt wants to say too, but the message is cloaked). it starts to feel like Baudrillard’s simulacra, where we keep creating representations of what we actually want to address, and we lose sight of the original thing we’re talking about. i think my role in life is unfolding to show how you can raise the level of discourse. i feel that too often messages are simplified and packaged for ‘easy consumption,’ but that really underestimates the ability of the reader to think for themselves and explore the depths of the issue. i don’t think people are idiots. a lot of the time i tie in critical theory with current issues, and i don’t see anyone backing down. people appreciate to be treated as if they have brains. i think it’s all about how you frame it. if you keep the expectations low, that’s what you get. but if you challenge ideas, bring new perspectives, and reference work that’s often locked behind the doors of academia, people step up to the plate. if we want to make real change, we should give people the benefit of the doubt to engage with this stuff so that it sinks in and broadens their worldview – then maybe people won’t just be led to the ‘next big thing,’ they’ll actually consciously be making decisions based on a better informed mindset. Venessa – many thanks indeed – really do appreciate your awareness that we do need to think about these issues in depth if we’re to have any chance of getting out of this collective mess. FWIW, I come at this from an enterprise-architecture perspective, in which the only way to break out of the ‘conventional’ IT-centric box has been to go right back to first-principles and re-think what we mean by ‘enterprise’, ‘organisation’, ‘market’, ‘asset’, ‘service’ and a whole bunch of other key terms. The same kind of re-think seems to apply in spades to the context in which the enterprise operates, such as ‘the economy’, ‘social capital’ and so on. So it’s been a real pleasure to come across others who really are thinking seriously about these themes. Thank you indeed! maybe this post comes down to nothing than a “thought exercise” with no less “answers” at the end than at the beginning – but i actually *do* find value in such a thing. being able to look at a topic from many angles, and as much depth as possible leads to informed decision making. if we ever wanted to really get to some type of relationship economy, i think it’s important to talk about the assumptions about society that that economy would rest on. Love these exchanges and the learning process. Could it be that our assumptions about most things are grounded in the wrong knowledge? Could it be that our conversations and exchanges are challenging what we think we know but really don’t know? If I knew what everyone in this thread knew and everyone knew what I think I know and don’t know just maybe we would all learn more. In learning more could our conversations represent the edge of innovation? Challenging what we all know ought not invoke ownership in what we think we know rather a desire to know more than we think we know. In doing so we may just be able to create new knowledge that all could and should benefit from. Challenging static knowledge is a good thing if in doing do we create dynamic knowledge which become a stream of new consciousness from which we can all discover possibilities to make “life” more abundance with less controls over what could be possible. Could it be that the mind set of the industrial era is shifting and the forces of “contained knowledge in corporate silos” is being broken down by individual freedom to learn, collaborate and create? If any of these questions stir a yes answer then it means that all old assumptions about the definition of “systemic thinking” goes way beyond what we thought we knew. IMHO the new era of a “relationship economy” is the actualization of our individual knowledge inventory as a trade-able asset that appreciates with interactive learning between each other and many. This dynamic has never been able to be realized until now. Now is the time we all learn to exercise that which is possible and forget what isn’t. I haven’t seen this stated quite this clearly before. It brings to mind two questions. First on the issue of “metrics” for social capital. Following the framework you lay out in the post, it seems to me that associations and relationships lend themselves to behavior that can be observed. Once behavioral data is indentified mathematical models can be brought into play. I wonder if you’ve done work in that direction. Second, have you or others who share this point of view ever focused on the high school as an enterprise? My thought is that if problem in high school dropout factories were framed as a deficit of social capital, it should be possible to craft minimally invasive interventions that makes them healthier with a fraction of the time and cost. Great questions – many thanks. This needs a proper-length reply which won’t fit into this space! 🙂 I’ll write one in the comments-section to the ‘The relationship is the asset’ post and link back to it here – may not be able to get round to it until later today, though. More later – and thanks again. Hi Michael – Re metrics for social-capital, and high-school as enterprise: have posted longer reply in the comments-section at ‘The relationship is the asset’ – hope it helps? Venessa, this is a topic someone picked log time ago. Being an SF&F junkie I had read the sci-fi book Down and Out in the Magical Kingdom & thus understood Whuffie better before I understood what social capital meant. I have been trying to remedy the situation. And for the business folks, any concept needs to be observable because they need to measure it. Thus I started reading about the measurement of Social Capital too and found Paldam. Looks like Paldam is really struggling with how to “implement” social capital in business. I think the problem here is that social capital essentially exists in a non-linear dimension, so you can’t create a formula to measure it. It doesn’t work that way. This is apparently mind-blowing to the business world, and indicative of much of the resistance by corporations to embrace “Social Business.” We’ve been fully indoctrinated with principles/rules of a mechanistic industrial economy, but we’re now in a post-industrial economy, where “touchy-feely” stuff like creativity, knowledge, and idea exchange play a more important role. As I continue to point out, you can’t expect to implement new frameworks on top of an outdated broken system. the old mindset + new structures are like oil & water. Until businesses are willing to truly implement change – which involves a new ecology of mind – it will be more of the same. Yes, yes and yahoo! Clarity of thought is missing but you nailed it with this response. We’ve been constrained from thinking because of the corporate silos. We’ve been programmed to “believe” a certain way and anything outside the box is rejected because it isn’t understood. There is a new understanding emerging and subsequently new knowledge fueled by innovative mindsets. On the edge of innovation lies the new economy which will be created by us individually when it cyctemically converges into a whole. Knowledge indexes will emerge and subsequently knowledge assets will become the new “trading mechanism” which in turn creates a new currency. Knowledge will become tangible and indexed for trade. Thank you for the response Venessa. I do agree that many businesses are too resistant to accept the change thats taking place that you mention. People like change (our taste in music over the years for example), but not when it comes from outside. Also, lets not bracket all the business folks under the same category. You could consider the crucial factor of social capital in the rural handloom industry of developing nations for one. Or the role of intrafirm networks [PDF]. Or how social capital makes organizations work. Lets consider a banker who gives a loan to a person whom he has known socially for quite a long time. It may be because he likes the person because of the investment in relationships (social capital), or it may be because his knowledge of the borrower’s character is helpful in determining the likelihood of default (maximize profits). thanks for those links. enjoyed the ‘how social capital makes organizations work’ piece. Excellent analysis and commentary around the subject of “social capital”. In MHO social capitlal is one part of the whol human network, on-line and off line. Ultimately all of us represent an inventory of assets and social is only one of them. Every time we converse, post and respond on-line and off we reveal ourselves. The word reveal means to make known, disclose, divulge, to lay open to view, display or exhibit. When something or someone is revealed each of us decides whether what or who is revealed has any relevance to us. Many of us don’t realize how we reveal ourselves. What we reveal are the things that attract others to us or us to others. Whether an organization or an individual what we reveal are common characteristics that bring us together or separate us. These common characteristics are transparently revealed in content that is in context to four things that determine who we are, who we want to be as well as who and what we attract. We are all assets of the human network exchanging value with others. Our value makeup is reflected by four knowledge assets that represents value to the human network. An asset can appreciate or depreciate based on many variables. The primary variable that increases or decreases an assets value is determined by the demand for use. Do The Assets You Reveal Create Demand for Use? When we use the term asset we think of things that stores or lends economic value. When we think of the term value many would quickly reference terms of an economic transaction. The human network creates economic value by what we do. We earn money for what we do and exchange the money for other things of value. What we do and the exchanges we make represent “value creation and exchanges” that are and continue to be produced by knowledge assets borrowed, owned or traded between two or more individuals. 1. Intellectual Capital: That which we have learned, understand, know and apply to life experiences. 2. Social Capital: The relationships we build and our ability to interact with others. 3. Spiritual Capital: Our sense and faith in a higher power other than ourselves, our intellect and our social capital. This capital is usually referred to as the knowledge of “God”. 4. Creative capital: The insights we see and the possibilities we create. Creative capital is influenced by the internal and external interaction of 1,2 & 3. We use our knowledge assets and share them with others, organizations, institutions and society at large. We get hired for who we are which is reflective of our knowledge assets. Organizations use and abuse our knowledge assets to their gain or lose. We share our knowledge assets with family, friends and associates. We exchange knowledge assets in the form of conversations, actions and insights. The #1 influence over economic output is individual and collective knowledge assets of people working together towards a common aim. Imagine if our collective knowledge assets were indexed, able to be searched and subsequently used, borrowed, shared and executed more efficiently. What could happen if we were enabled to identify and connect knowledge assets for collective gain? Our life experiences shape our knowledge assets defined and then revealed by what we say and do. Collectively our knowledge assets represent the gifts and abilities we have, both the good and bad, which are ultimately shared with others through interactions and future experiences. Social technology could enable individuals to leverage their knowledge assets for the benefit of others thus creating a giving exchange that provides exponential value. The technological medium will eventually index knowledge assets and create a new economic paradigm when knowledge becomes connected and taken out of silos of information. The future web will enrich human experiences by giving, sharing, learning, relating and re-enforcing or improving the four things that reveal who each of us really are and what we have to offer and learn from each others. What could happen if we were enabled to identify and connect knowledge assets for collective gain? though after this post, i’m rethinking using the word ‘capital’ anymore… seems to have too much baggage. Dan Robles has actually mapped out the “Knowledge Inventory and related assets” and defined how we individually will collectively create a new economy. The baggage of “capital” is because of its context to the old school definition and the new school theories that try and frame it into a silo of knowledge, i.e. social. You and Dan Robles are seeing the same end and I’d strongly suggest we all collaborate to create a new greatly improved future. With the increase use of social media everyone seems to categorize its use into one dimension or another. Some categorize the value equations as social capital, reputation capital and a host of other names which are attempts to define the emerging value proposition. These attempts reflect emphasis on the parts rather than the whole. You’ve heard the expression “the whole is greater than the sum of the parts” which, in my humble opinion, should be how we view all the related knowledge gains being created by all this social stuff. The whole can best be categorized as a system of knowledge, past present and future. The “parts of the system” represents each of our experiences, education, interactions and beliefs. Capital is produced when we exchange some or all of our parts when expressed in words, images, video’s and threaded in conversational exchanges. If we look at the parts of our human DNA we can see a system of intellectual, social, creative and spiritual capital. The combined interaction of each of these capital components with others, society and institutions creates life’s experiences, outcomes and results. Each of us carriers an inventory of knowledge that are subsets of each capital component. We draw on these subsets when we engage with the world. Not unlike the Encyclopedia Britannica our inventory of knowledge is our “book of life” and we use the contents to produce value on a daily basis, whether personal or professional. Capital represents the value we produce using our knowledge assets. Our economic paradigms seek to gain a currency from use of our assets. Today the currency is in the form of a weak and weakening dollar. In the future the currency maybe something else but the capital behind the currency has and always will represent our individual knowledge assets. Our social capital is only one part of the whole but the whole is greater than the sum of our parts. Individually we are the parts, collectively we are the whole. thanks for link to innovation economy site. we’re definitely thinking along the same lines. In her book Tara Hunt says that she is adapting the idea for Whuffie from Cory Doctorow’s book Down and Out in the Magic Kingdom (http://craphound.com/down/?page_id=1625) where it apparently does pass as currency. I wrote a post two days ago about the many uses of the word ‘innovation’ and how I don’t like it when people try to regulate (or suppress) the use of the phrase. Now I’m not so sure that I was right, because here I’m pretty strongly in favour of not using Social Capital and Whuffie as equivalents – so my argument might not generalise. You’re correct in saying that they are two quite different things. I think that reputation (and the management of it) is critical. But really, I think that the real error in logic is talking about it as though it is an individual characteristic. Surely reputation is a network property too, isn’t it? 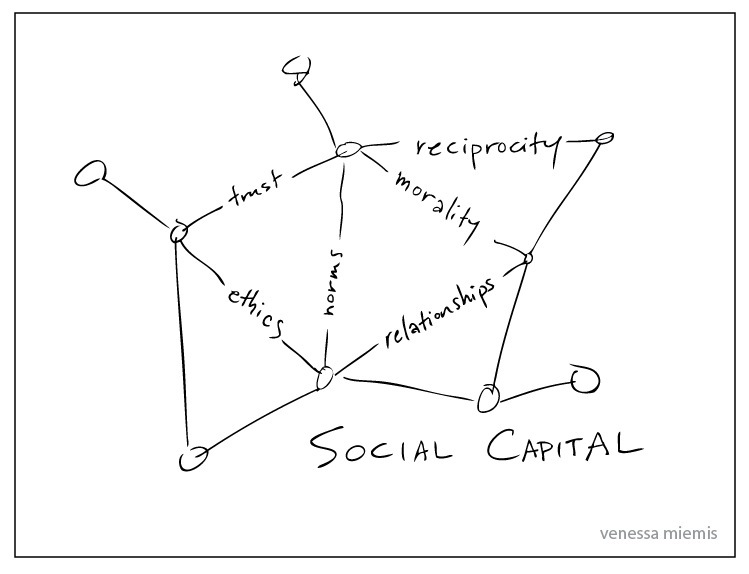 Having read Venessa’s post and the discussion so far, it appears to me that it comes down to a simple linguistic problem of homonyms: the term “social capital” as being used in the context of sociology, politic science, etc. and the same string of characters now being used in a more marketing/commercially/(?) oriented context. We’ve already had the problem before (e.g. “ontology” used by the semantic web community vs. its original use in philosophy; “affordance” used in cognitive psychology vs. its different uses in human-computer interaction). I think there’s nothing wrong with re-appropriating vocabulary for your own means, although I find it questionable to take words that already have kind of an established meaning and use them in a not so different context, but with quite a different meaning. To avoid this problem, usually a reference to the definition being used suffices. Or the long-established “social marketing”, a means of effecting social change through marketing, being co-opted to mean “marketing (anything) through social media channels”. Pretty confusing. And this is what I was suggesting in my first comment. I think that Hunt is a marketer who is marketing for marketing’s sake. She’s almost marketing marketing, and that’s what led to the confusion. seems so. contextual, like everything. there how you see yourself, how other individuals see you, and your reputation as determined by the collective, all which are in flux. it’s determined by your behaviors and actions, but also by external information, and your personal ethics. the example i’m thinking of is Trader Joe’s. i can say they have a good reputation, because they sell organic food, and buying food that’s not poisoned by chemicals is something i believe in. then i discover a farmer’s market which also sells organic food, and realize that by buying there instead, i’m also supporting the local economy, and that to me is important. does trader joe’s reputation go down? well, sort of… i still like their organic food, but supporting a local economy is even more important than supporting a chain that offers similar products, maybe even at a lower price. then i decide to act in tandem with the farmer’s market, and decide to start a garden in my backyard. now my reputation goes up, at least in the eyes of the people who also believe in local economy and sustainability. for those who don’t believe in it (like my neighbor, who told me last summer that farmer’s markets are for “treehugging hippies”), my reputation may actually go down, because they think it’s a ridiculous waste of time to grow your own food, when it’s easier to just go to the supermarket and buy what they sell you. so when it comes down to it, your reputation is a reflection of the value system of the observer – and everyone’s ideas are a little different, either by choice, or because they’re uninformed of other options and so think their way must be the right way. (here i think of religious wars). now it seems we’re boiling back down to social capital, this embedded value system upon which reputation, economy, & society are built. Just to confuse things, it’s actually both: a network-property that is ‘attached’ to an individual as if an ‘individual characteristic’. It’s actually an ‘aspirational asset’, in much the same sense as a brand (and in effect reputation is a kind of proxy for personal-brand). A ‘relational asset’ is something that exists between people (or organisation as collective proxy for people), hence it only exists if both parties know it is there, and mutually maintain it. For a brand or other types of aspirational-asset, it’s kind of non-mutual one-way ‘relationship’, from a person to an idea-of-something. The ‘to-side’ doesn’t need to know that the relationship exists, and may not need to do anything active for the sort-of-relationship to continue to exist. Doctorow’s Whuffie is an externalised metric of those ‘to’-relationships, as as a ‘network property’ accumulated from others by an individual. But in effect it is a transient attribute of the person, not an externalised ‘possession’ – hence, crucially, it is not directly exchangeable with others, and hence cannot be used in the same sense as money. It can be created via mutuality etc in the social network (as per Tara Hunt’s ‘Five Principles’), hence may give the illusion that could be used as money – but any attempt to use it in a money-like fashion (e.g. via attempts to ‘control’ others, or to manipulate reputation-relationships etc via ‘double-entry life-keeping’) will usually cause a very steep loss in Whuffie. Money is an abstract ‘idealised’ version of barter that was originally designed to work with concrete, transferable, externalised, ‘alienable’ entities such as physical objects or in-person services. For anything outside of that scope, it does not work well, if at all. Reputation is fundamentally different: it is abstract, non-transferable, internalised, and non-alienable. Hence, as per my earlier comment, one could ‘trade’ on Whuffie, but not trade Whuffie itself – a distinction that is subtle but absolutely crucial in this context. >>The World Bank study defines natural capital as the sum of cropland, pastureland, forested areas, protected areas, and nonrenewable resources … Produced capital is what most of us think of when we think of capital: machinery, equipment, structures (including infrastructure), and urban land. But that still left a lot of wealth to explain. “As soon as you say the issue is the wealth of nations and how wealth is managed, then you realize that if you were only talking about a portfolio of natural assets, if you were only talking about produced capital and natural assets, you’re missing a big chunk of the story,” Hamilton explains. (Full article is at http://reason.com/archives/2007/08/03/our-intangible-riches ). In actual economies, as Henry George noted, land values often are a key indicator of the intangible (social) capital in an area — such as trustworthy dispute resolution systems and transparency in governance. In online realms, I believe Second Life and others are introducing land markets as a way to encourage experimentation and competition in the social realm. It’s also good to see Hayek’s ideas on competitive currencies getting traction online. Over time, we find social ventures and “serious games” issuing currencies that reward those whose actions build social capital. These efforts may not produce any single “metric” or point system useful to all. But their innovations should yield new insights into social/intangible capital, and provide a springboard for further discoveries. i thought this quote was great… i think about this when i think of the humanitarian efforts in foreign aid, but ultimately capital isn’t a patch for infrastructure. which brings me back to the thought that an individual’s capital (whuffie) isn’t as important as the focus on the infrastructure of relationships (social capital). Great summary, Venessa – a really important distinction. When considering social capital, we are not, I don’t think, exploring anything new. you might enjoy The Culture Industry: Enlightenment as Mass Deception; looks like Fromm was associated with Horkheimer, so probably influenced by/affiliated with these ideas. Do you know of Thingamy ? Jon – Funny you should ask that… 🙂 – ‘cos I was literally writing about it just now in another post on my own blog. Not sure what the connection is for you in this context, but Sigurd Rinde’s concept of ‘barely-repeatable processes’ is certainly an important one that has been much-overlooked in the enterprise-software space. @Tom .. I’ve known Sig and about Thingamy for about 4 + years now, and just interviewed him at length about Business Process in the Network Era, which I will probably write up for the FASTForward blog. One of Sig’s key points is that we need to re-think (or at least discuss deeply) our current assumptions and established conventions about many of the things to which you pointed. Yup – would agree with him (and you) too on that. We’ve had a few good conversations, but not for some months – need to get back in touch again, hence thanks for the reminder. I agree that Brian was a little loose with the traditional definition of “Social Capital”. I too cite Robert Putnam, Jane Jacobs and others in my research. On the other hand, as we enter a new economic paradigm (post-dollar, post-knowledge economy), several definitions are falling by the wayside. For example: the definition of “Innovation” falls dramatically short of what, when, where, and how innovation is actually occurring. Brian’s post does serve to create at least as many new questions as it seeks to answer. And it is important that writers such as yourself bring these issues to light. How exactly do we marry a social currency to our existing financial system? How exactly will a new financial system serve social priorities over Wall Street/DC priorities? Brian stuck his head out pretty far and offered up his neck for the benefit of those who seek to answer these questions. I liked your article because it was expansive rather than deconstructive. After reading your article, I felt that the subject matter had been expanded. In our long march in this discipline, I have also encountered deconstruction – that is, anything that questions the current financial system is automatically invalid. So congratulations on a fine rebuttal. The Ingenesist Project is 100% creative commons so you are invited to use our work as you see fit with citations. I encourage you to keep this subject alive in your writings and research. Thank you. the post wasn’t meant to insult brian (or tara) – it was meant to expand on what they wrote. this stuff is challenging to think about, and i think we’re capable of engaging with it more deeply. if people just take ideas at face value, without understanding the history behind it, i think they miss out on a depth of comprehension that’s necessary to really make changes. i talked to brian about his post, and his response was along the lines of ‘you can only go so deep in a post.’ and i agree. i was just proposing a challenge to at least allude to how deep of a topic we’re really talking about here. @Jay, this kind of ‘stuff’ has been explored before, several times. William Halal of George Washington University has been writing about markets for knowledge since almost forever. (1986) – The New Capitalism – Business, Economics, and Society in the Information Age, (1993) – Internal Markets for Knowledge – Bringing the Power of Free Enterprise Inside Your Organization … etc. True however like everything else previously defined until it becomes realized it is only a definition. Knowledge assets can be and will be realized when the current technological paradigm shifts away from poorly designed taxonomies that forgot that humans use technology and we use it to learn and converse. Within the learning and conversing emerges a new knowledge inventory that can be captured, traded and monetized through innovation. The realization and visualization of knowledge takes it out of definition and into recognition. From recognition to actualization. That is on the edge of existing conversations which are not being inventoried as knowledge assets. I’ve been chipping away at this rock for 20 years since negotiating NAFTA for Knowledge workers in 1993. With all due respect for those who came before and for those who will come after, there is an extraordinary opportunity available right now. The dollar is vulnerable. The world is trying to ditch it in favor for a currency backed by a basket of commodities (at best). We have an opportunity to toss a social currency into the mix- one that truly represents human productivity and which rewards high integrity and punishes low integrity. If we are really really really clever about it, it can be done very easily. This is the only way to introduce social priorities into the market in case anyone is wondering. We’ll need to work together – that’s social capital. While in some ways this is a conversation that highlight productive disagreements about the nature / definition of social capital, in other ways, it just shows how impoverished our understanding of social capital has become: particularly in the 21st century United States. And particularly amongst certain segments of the techn0-venture-capital-digerati set, where a rising tide of digital fluid inevitably lifts all boats into some sort of conflict-free web utopia. “Putnam’s concept of social capital has three components: moral obligations and norms, social values (especially trust) and social networks (especially voluntary associations). Putnam’s central thesis is that if a region has a well-functioning economic system and a high level of political integration, these are the result of the region’s successful accumulation of social capital. Interesting that we might think that “digital literacy” is a driver of equalized influence. African villages do not have access to the internet yet word of mouth of an event travels almost as fast as the internet can carry it. Doc Searls, The Cluetrain Manifesto”, theme “markets are conversations” was developed on the value of people conversing, not how or what they use to converse. What goes on-line comes from off line and what comes from off line gos on-line. We are witnessing a system in flux and being influenced by the exchange of ideas propagated through conversations such as the thread from this post. Which is very likely to be discussed off line. Some while back (was in one of his newsletters – apologies, can’t find the link) Doc Searls relates a story of an airline conversation with an African priest re his ‘markets are conversations’ thesis. Longish story, but the summary is that the priest shows him that he’s missing a whole dimension in his markets models – markets are not only transactions and conversations but relationships too. Hence markets are one potential place for creation and interchange – but not, we may note, exchange – of social capital. The market as a a whole is an expression of social-capital, whilst reputation and trust are expressions of the individualised ‘social-capital’ of an actor within the market. Without respect, there is no attention; and without attention, there is no transaction. Note that the ‘barter/money’ add-on only occurs in a dysfunctional economy based on the psychological delusion called ‘possession’ – it does not occur (nor does it need to occur) in a functional economy. (The word ‘economy’ literally translates as ‘the management of the household’: trying to run a household on strict monetarist/possessionist lines is a guaranteed recipe for disaster…) That the notion that ‘the market’ is primarily about money in essence indicates just how dysfunctional our society has become… :wrygrin: If we want a market that works, we need to base it on social-capital – not attempt to run the whole thing back-to-front by focussing solely on short-term monetary profit. Would like to know more about your book, though, and where you’ve taken those ideas since then: links, please? – and my thanks, of course. The book is available on Amazon but it isn’t worth the purchase 🙂 You can get a copy free as an eBook from my blog http://www.relationship-economy.com/ see book image on left sidebar. The book was a collective effort to examine the “factors” that were evolving which would lead to a Relationship Economy. Thus the reason I blog every single day of the year sharing perspectives, ideas and observations. Fundamentally the original thoughts and subsequent learning have led me to believe, with confidence and verification, that the dynamics of the web will eventually converge around knowledge assets and subsequently a new kind of economy whose rules of engagement and actualization will create a new currency. Jay – many thanks for that – looks very interesting indeed. if by ‘social capital’ this means “the influence of networks,” then of course. if social capital is being equated with power, then sure, power has always been used to dominate or to integrate. and then if what you’re talking about is the potential for the Internet to be used in order to leverage power – we know this too. there are a bunch of organizations that have been setup as watchdogs to protect civil liberties online, like the Electronic Frontier Foundation. i haven’t read bourdieu, but the way you are presenting it, it sounds like he’s talking about leveraging individual influence/power – which is to say, abusing the social capital of a network. the way i am understanding all of this is that the concept of social capital is about the intangible underlying value system of a network – its ‘beliefs’ about how to operate. the problem i see is that we’re having trouble distinguishing the market from culture – instead, trying to equate them. @Venessa – “power has always been used to dominate or to integrate”. A fair chunk of my work has developed from noting an unfortunate dichotomy: the physics definition to power is close to ‘the ability to do work’, whereas most social definitions are closer to ‘the ability to avoid work’… wherein lie a huge number of social and other problems. Key to that is an acknowledgement that ‘work’ takes a vast number of different forms – physical, conceptual, relational, spiritual and so on. Digging a ditch is work, as is solving a technical problem; but so is calming a frightened child, reclaiming hope from despair, or negotiating relationships in complex social dialogs such as these. And there are vast numbers of ways to avoid those forms of work – flame-wars are one obvious form that we’ve thankfully managing to avoid in this conversation, for example. Worryingly, some of the core fundamentals of ‘Western’ society’ are based in serious work-avoidance – the concepts of ‘rights’ and ‘personal property’ are perhaps the most difficult here, since both are founded in avoidance of the work of negotiating shared relationships and responsible shared-use of resources over time. Thanks for bringing the (very pertinent) Bourdieu into the discussion. >>”Social positions and the division of economic, cultural and social resources in general are legitimized with the help of symbolic capital. From the Bourdieuan perspective, social capital becomes a resource in the social struggles that are carried out in different social arenas or fields. 3) dozens of fast-growing online markets for telework (Rentacoder.com et al) that let individuals bypass past gatekeepers and rapidly access jobs — and build global reputations through voluntary P2P exchange. It seems to me these forces are demolishing power relations in their traditional forms – and making possible an era where self-organizing systems design and build a range of new opportunities for consent-based exchange and cooperation. Bourdieu’s insights may be relevant to eras of scarce/centralizable resources and zero-sum power struggles, but I don’t see their applicability to an era of 3D fabs, nanotechnology, and digital abundance generated by social production as well as exchanges in online free markets. The effect of these new forces may be to fulfill Marx’s non-statist vision, in “On Human Production,” of an era of radical abundance in which individuals – rather than plutocracies or revolutionary oligarchs – gain and keep the freedom to set directions for their lives. The whole idea of ownership is shifting dramatically, which means the whole idea of capital is shifting dramatically. Each individual now owns the means of production (assuming access to, and knowledge of, the digital realm.) I think that was part of what Solis was driving at. Much of legal, governmental, business structures that were set up to define who owns what and keep them separated are breaking down, but we seem to be OK so far, possibly more efficient and effective. It’s great to see an educated challenge to “made up” terminology. One of the challenges we have commercialy with these media is a perception they lack a disiplined foundation. If we allow glorified account managers who touches social media a few time takes it upon herself to make up baseless terms that sound fun to describe concepts already well defined by professionals and thier fields of work we run the risk of discrediting all who are working towards establishing social media as a serious field. the underlying premise of hunt’s book (which i have read) is a good one. she’s calling for human-centric values, packaged in a marketing book, using economic metaphors. that’s great, and i’m sure plenty of people who read the book “got” the message. BUT, i just don’t feel that “social capital” can be recoined….. it’s not like it’s a term that went out of usage a few hundred years ago and we’re dusting it off and repurposing it. it’s currently in use – fukuyama, for instance, is currently a political economist teaching at john hopkins university. people are working hard to understand how these principles will operate in our future economic models. i don’t think it’s fair to oversimplify it as being equivalent to whuffie. The Cluetrain Manifesto”, theme “markets are conversations” was developed on the value of people conversing, not how or what they use to converse. I count Doc, Dave and Chris as online friends, but TCNM is basically about marketing in a networked era. Yes, yes, it touches on changes to the zeitgeist and truth-in-advertising rather than corporate-speak … and yes, it was about people using the internet, with a less-than-fully developed metaphoric connection back to ancient bazaars. We are bringing human sociology to another widely-used medium, re-creating it (in effect) in and on that medium with the twists that public visibility and (perhaps) accountability, and the changes to time and space, bring. Yes, digital literacy is important. Plain old literacy combined with the ability to think critically is even more important, IMO. Why does the US fund three separate ways of obliterating the world with its (ever-increasing) defence budgets, and then keep making states and municipalities keep on cutting funding for schools and teachers ? I once upon a time (back in ’05) wrote an (incomplete, still) article or blog post titled “The Medium is the Meaning We Consume and Create Together”. Arguably, the Web is the “public space” where the culture(s) of tomorrow and the future will be shaped, by and large. Making that activity more and more visible can only, eventually, be for the good, I believe. This post by a friend of mine (Harold Jarche) titled “PKM – a node in the learning network” may be of interest to some or all who are following this post and comments thread. Touches on the role of the individual, trust and sociality (or social-ness ??) in the process of ongoing learning (and thus, the eventual creation of innovation and new economic value). Surely social capital is a public good – not a private one. It is a property of community. Putnam’s definition (“By social capital I mean features of social life – networks, norms, and trust – that enable participants to act together more effectively to pursue shared objectives”) is interesting to consider (this whole debate is) with regards to the recent Kevin Smith vs. Southwest Airlines social spat. Smith has a lot of “reputation”/Whuffie—that is, he’s famous. But he has a lot of Putnamian social capital as well—a big network, the ‘norms’ of being a not untypically overweight American man, and the trust garnered from exposing himself through art. Both combine to give him a lot of influence, and when he squawked, Southwest was damaged in their ability to “effectively pursue their objective”, making money. What I’m getting at is that while Brian, Tara, et al are talking quantifiable reputation by necessity because their business is marketing, perhaps there’s a “meta” in here somewhere that makes the marketing definition of SC a microcosm of the sociological definition. or maybe their definition works in the world in which they use it, and the sociological definition is subservient in some contexts. or does the sociological definition need a level of imperial, meta power in order to be valid? Venessa: reading one of your blog posts – and associated comments – is like watching an episode of PBS Frontline. I come away with a deeper and broader appreciation of the nuances of an issue, better informed but less certain, having more questions than [final] answers. Personally, I think this is a Good Thing, though this is not a widely shared belief in an era of increasing fundamentalism. After reading all of the foregoing, I’m not sure I have a clearer sense of the distinction between social capital and whuffie / reputation, but I do have a better awareness and understanding of some of the issues involved in these densely packed concepts. In reading the post and the comments, I found myself thinking about Doug Rushkoff’s book, Life, Incorporated: How the World Became a Corporation How To Take It Back. It seems to me that one of the potential problems is not so much in viewing social capital as a measurable or even as a financially monetizable asset, but in the prospect that a person or organization with social capital might use it to exploit the network, extract the wealth and redirect value for the benefit of the individual or organization in ways that do not [also] benefit the network. Joe, wouldn’t it be unlikely that someone/something that has put in the honest effort needed to accrue SC be, by definition, so transparently good that they wouldn’t extract the wealth greedily? Btw, apologies, Venessa with an ‘e’. Erica: I don’t believe that social capital is only accrued through honest effort. People can and do claim and/or receive undeserved credit for social contributions for which they are not responsible. I suspect that increasing use and acceptance of mechanisms for measuring – and displaying – social capital are more likely to motivate dishonest efforts to accrue social capital. If we’re talking social capital as reputation, then no. But as defined by Putnam etc, it’s a positive earned through cooperation & facilitating society’s goals. I know what you’re saying though. you said: “a person or organization with social capital might use it to exploit the network” – again, a person or organization can’t have social capital – social capital is the embedded value system of a network; a person or organization can, on the otherhand, have reputation/influence/power, and wield that to exploit the network. i’ll have to get him to expand on that next time i see him. I found myself thinking about Doug Rushkoff’s book, Life, Incorporated: How the World Became a Corporation How To Take It Back. It seems to me that one of the potential problems is not so much in viewing social capital as a measurable or even as a financially monetizable asset, but in the prospect that a person or organization with social capital might use it to exploit the network, extract the wealth and redirect value for the benefit of the individual or organization in ways that do not [also] benefit the network. Thanks for this @Joe McCarthy. That today all of us spend much too much time thinking and talking about money and how (virtually necessary) someone or something must be exploited / used in order for someone else (or something else) to profit .. we have lost or are losing the plot as to what it is to be human. Money and making more of it is still not quite the purpose of life … helping ourselves and other humans to live better lives (in the full range of splendour as to what that may mean to an individual, a family, a group .. is .. or should be, IMHO. i’d love to see more both and thinking on this thread, if possible. starting out with a goal to exclude something (wuffie) from a particular realm of meaning is probably why it’s trending this way. i just see a lot of scarcity thinking in the either or stuff. it is this, it can not be this, what if this happens? more risk and fear based than i like, but maybe i’m just seeing things in a sort of academic discourse that are not there. but i have a tripartite anglican epistemology because i like having three places to stand rather than a binary frame that gives you more leverage to slug it out with the other side. with three places to stand, you can move aside and get ahead together. get to the table even when you disagree. I second kevin jones’ comment. Both/and generally a very useful orientation for linky thinking. bringing in the question of trust and linking them with markets causes the question of whether markets really require trust. some say that’s theory. it is actually fact. if they violate that trust there are consequences. was your trust violated? what are you doing about it? if you do nothing you are complicit in that violation. there are other markets forming where other, more than financial value has a place, the space between giving and investing. but if your trust has been violated in the traditional market then you have to act. move your money. change the way you invest. change the way you spend. put your money where your values are. What great dialog from many great minds. An example of “storming, forming, norming and ultimately performing. This subject matter deserves constant examination and dialog. After all we are talking about the creation of a new paradigm and a new economy emerging from new thinking. If interested feel free to join http://www.conversationalcurrency.com a community moderated by Dan Robles and the content is focused on discovering a new currency using all forms of capital 10intellectual, social, creative and spiritual…..the new knowledge inventory built by we the people. You can add your blogs rss feed if your content is in context to this subject matter than deserves ongoing dialog and persepctives contributed by great people like you all. left a comment on the blog. your basic anglican epistemology perspective on a binary frame. i hope this conversation does not generate into speculation about tara hunt’s motives. me too. if you read the post and all the wonderful comments, this isn’t even about hunt or whuffie. i used brian’s post as a primer for us to have a discussion of social capital in its many usages and meanings. the point was to expand the range of the conversation to be inclusive of different views, and ultimately to have a conversation about the underlying value systems we seek to establish as we build a better society. my apologies to tara and brian both if anything here is interpreted as something personal. The tweet you quote says it all! i would not come to that party either. i saw that tweet of yours and hers yesterday, and i reached out to her, asking her to take a look at this post (and the comments) and see that words were not being put into her mouth. rather i was challenging equating social capital with reputation, and pointed out the damage that can be when people take that assumption at face value instead of looking deeper at the message. (i.e. thewhuffiebank.org) – she used an economic metaphor to describe a concept that actually would be an attribute of a *highly* evolved society, and what happened? someone went and took the metaphor literally, and now has created a reputation ‘bank.’ i pointed this out to her, and she said that i should have framed the piece in those terms then. i thought that i did, as i described above that by using words like ‘metric’ and ‘balance sheet’, people would miss the big picture and get focused on the quantification of value. anyway, i *think* we came to an understanding that this wasn’t about her, it was just an entry point for a bigger conversation. As members of a “fifth estate,” you should feel free to question intentions. Unless you are worried about backlash? You operate a media platform, and you have every right to question motives. As an investigative reporter I did my share of investigating motives. but that’s not useful here, i think, or at least i decline to engage in it at this point. it’s not really about questioning intentions for me. my speculation is that tara was inspired by an idea about how a highly evolved society could operate without money. in this world, the strength was in human relationships and fundamental values. she wanted to communicate this message to the marketing world, to suggest a better way of operating, putting people instead of selfish monetary incentives first. so she wrote a book with an economic metaphor to describe that idea, knowing that a book that was just about the “touchy feely stuff” of positive human motivation might miss the mark. and i’m sure her book had the impact she wanted for many people, and that’s a great thing. that’s what we all want. but some people can’t conceive of that kind of a world and missed the point. Instead of focusing on the idea of how we should operate in business, the focus was on ‘how do we measure this new thing, whuffie?’ i already mentioned in the comments about thewhuffiebank.org, which to me is an example of how things begin to get off track when the message is misinterpreted. (she has nothing to do with the site). to me, the site took the idea of whuffie as economic currency literally, and then created a score out of it. that takes away the human side, and becomes another system to be gamed, verse leading with a value system in business that isn’t directly measurable, but rather a reflection of your character, integrity, and social ethics. Maybe we are all talking about Goodwill? though i’ve sold businesses where i’ve been paid more. Isn’t that one of the key aspects of people trying to get lots of followers, or high rankings, etc. Proxies for social capital when trust is relatively low, or based on identity or “brand” ? And the other less happy side of all this .. Minds For Sale .. gets pretty ugly / scary at about 40 minutes in ..
great thoughts and discussion as usual. i actually had been avoiding the use of the very term “social capital” because i saw these problems – but instead of discussing them (which i should have done) i simply decided not to mention it in my work. however, at the rate this social influence and ROI obsession is growing there is no way to avoid this subject. you did a brilliant job in getting us all to think and question these assumptions about the idea of social capital, a complex concept that is multifaceted to say the least. thank you for a wonderful conversation. This is what I was trying to get at way up-thread, referencing Fromm, Rebel Sell .. and a subsequent comment about money and profit net quite yet being the purpose of life, even though from talking to many people you wouldn’t guess the separation (money from purpose of life) is in place in their heads. A;; too often we’re somewhat like fish in an aquarium, trapped by boundaries we no longer see. kind of my thoughts as well. the idea of social capital alludes to something a lot more expansive, and i didn’t want to see the conversation devolve into measuring reputation scores. anyway, i agree with hunt’s bigger message – that leading with integrity in business doesn’t have to be the territory of science fiction. “leading with integrity in business” has always been path to managing going forward risk of exchange failure. With opaque networks “integrity” is the monetizable value. eg the rise of the Rothschild bank after the Napoleanic Wars. As networks become more transparent, “integrity” that creates going forward trust has moved from a “nice-to-have” for globals to a “must have” to manage brand risk. Can you check out Debategraph.org, and see how it might help conversations such as these unfold and evolve? It’s delightful to see the vibrancy of the discussions on your blog. Yet the conversations have lives usually measured in days or weeks before going quiet. Tools such as Debategraph might enable them to thrive. Ideally, there could also be “metagraph” for your blog that lets people navigate multiple posts and interconnected issues. Also, it would be great at some point to see whether the community here could try, as well as discuss, varying forms of ways to build (and measure?) social capital through conversations here. Although it’s easy to posit “relationships as assets,” the challenge is come up with ways to make this meaningful/measurable. A promising measure of social capital may be the willingness of members of a community to donate time or other resources in support of choices made by others. Pledgebank.org, for example, converts the action potential of social relationships into specific contributions. I think EmergentByDesign could spark interesting tests of converting the social capital/relationship assets here into contingent pledges for real world activity. I may be just speaking for myself – although I don’t think so! – but it would be great to see “challenge offers” that you curate of opportunities to mobilize attention, time and resources for efforts that enrich the commons. Prioritizing your wishlist of tasks to enhance EmergentByDesign – and inviting opportunities for contingent pledges/co-creation – could convert the latent relationship assets/social capital into actual value. After a proving period, the system might be expanded to enable others in the community to similarly put up their activity wishlists and invite contingent responses by others. 2) Practical value for the EmergentByDesign community (research projects, etc). One further note. Earlier this decade, Clay Shirky gave a speech that I recall was titled “The Group Is Its Own Worst Enemy.” It detailed how the culture of online communities, once they catch fire (as EmergentByDesign is doing), can be extinguished as floods of incomers arrive who are clueless on the animating aims, values, and ethos. My guess is that this flood will soon consume much of your curating energy. I hope you’ll can find ways to overcome this challenge, perhaps by leading a charge to design a system for individuals to build reputations through voluntary contributions to the activities (chosen by you) that will most help social capital continue to form in the EmergentByDesign network. wow mark, quite the challenge. the growing community and depth of contributing viewpoints/ideas here never ceases to impress me, and what started as a personal blog to jot down my ideas about things has definitely become more of a forum where i’m a conversation catalyst, at best. i honestly haven’t thought about ‘what’s next’ for the blog, and i wonder if others who participate here would want it to ‘become’ something. i definitely have thought about the idea of some kind of ‘metagraph’… (i’ve actually used the term “thinking trails” in my mind), where people could follow different trails of posts to see how we’ve been unfolding ideas and covering ground. do you think i should write up a post asking everyone what they think? Brian sparked the dialog. You took it to the next dimension by questioning the premise and related dynamics. Subsequently the “crowd responded” indicating diverse interest in the subject matter and the quest to defining the next economic paradigm. Call me crazy but within these threads rest a knowledge inventory which when encouraged, ignited, connected and aimed could and should create a new body of knowledge that collectively would and should create a “new tipping point” which markets will follow. It seems that timing and space has brought this to a point of needed exchanges which, taking out our egos as much as possible, could be the emergence of new revelations sourced by the crowd and asopted for use by whomever desires to move the ball to a new point. The reality is that “community” does indeed represent the power of change when knowledge assets are applied to the common good and benefit of a larger community. After all, the national debt ignores all past logic and the only way out is through innovations and the creation of a new currency. Otherwise our economy, as currently defined, is indeed bankrupt. Denial is not an option rather creation is the only way out. I say lets take the ball and run with it. Whomever desires to organize and lead lets all follow. This isn’t a popularity contest rather the need for problem solving at new dimensions. Politicians, corporations and institutions cannot solve the problems that tribes solve naturally. Lets get around a camp fire and converse. Since you and Brian started the fire then those wishing to participate should easily volunteer time, effort and intellect. My hand is up while in comparison my intellect is low but I can add my own life experiences and perspectives to stir the dialog. I’ll serve in whatever capacity helps moves the ball forward. You’ll be inspired, I hope, by what unfolds in the “Leadership and Tipping Points” YouTube clip ( http://j.mp/9HXyzr ) . I totally agree. Here’s how I think about it. A single person can not have social capital. Social capital is a property of a network or community. While there are various definitions as you pointed out, here’s a decent working one that’s my own synthesis: Social capital is the connectedness, trust, and reciprocity within a community that gives it the capacity for collective action. Social capital is important because it’s the prerequisite for collective action. Communities can’t adapt and change without it. As individual, you can help build social capital by network weaving (for instance), and those actions can benefit you, but the social capital you build is not yours. Rather, social capital is a commons. You can contribute and benefit, but it is not your property. It’s shared. Here’s the problem with this misrepresentation and individualistic framing of social capital by contemporary business writers. It’s a linguistic enclosure of a commons. We should not fence off and sell that which is common property. If we do, we might destroy that which we depend on for our very survival. Our fates are tied by collective phenomena, including social capital, which bind us together and give us the capacity for adaptation. Yes, social capital is an outgrowth of trust relationships that are built via sharing/exchanges that respect and enrich the participants. Yet it does not follow (for me) that uses of social capital in networks should be subject to collective decisionmaking. I do see plenty of scope for individuals to make personal gifts/investments in response to the social capital generated in the network, in ways that enrich the comments. Let me give a personal example. As one who believes life offers opportunities to grow an inclusive, extended self (soul? ), I look to engage with individuals and networks creating ideas (memes) and qualities of spirit (lumines) that I admire. These interactions can be seen as “selfish,” in that they are advancing values important to my sense of extended self. Or they can be seen as “altruistic,” in that I’m sacrificing a (narrowly-drawn) view of my self interest to help seeds of ideas and virtues evolve and thrive. Dawkins’ insights on altruism as being driven by selfish genes, I think, is way too confined — we may well be equally driven by evolution to help “selfish” memes and qualities of spirit spread. The point I’m getting to is that the individualistic and collective frames can be concurrently valid. In generative communities such as this, I find plenty of people whose insights and wisdom go deeply into areas that I care about — areas that have been often blurry to me. I don’t want to invest efforts to become expert in their areas, given the spirit of sharing that animates them. Instead, I’d like to respond to the social capital they’ve helped build by offering, as an individual, to give part of my attention, talent, or resources to help further their quest in activities that they think will be useful. And I’d like to do so in ways that may prompt others (a la Pledgebank) to do likewise. Such offers are inspired by individuals, yet promoted by the social capital accumulating in the group. They’re gifts to the commons from one perspective, yet fundamentally selfish acts in helping valued memes and virtues to evolve and thrive. Networks open to such decentralized, self-organizing, and risk-limiting interactions in my view will create more social capital – and discover more innovative ways to use it – than other networks grounded in collective decisionmaking processes. If social-capital is a network-effect, how can we say that it is the possession of any one person? And if it is not a personal possession, how can we build a currency on it? Or, to take the more direct inverse, why are we talking about ‘currency’ at all? If the core is the network, it seems not only that there’s no fundamental need for a currency, but that a currency or other medium of exchange is a dangerous red-herring that, by its very existence, damages or destroys what Venessa above described as “the infrastructure of the network”. What this comes from is a recognition that there’s no way to create a sustainable economy without a sustainable system of law and custom that supports it. And it doesn’t take much effort to recognise that there is no way to make a possession-based economy sustainable – and yet possession is, as we’re often told, “nine-tenths of the law”. So we have a problem – a very big problem. Whatever we develop from here, it will need to re-think the balance between the individual and the social. At present – especially in the US model of ‘rights’ – the individual has absolute priority over the social: and it does not work. So what does work? Any ‘currency’ will leave all of these problems intact, and will no doubt add new ones too… Hence my concern that we need to do a much deeper re-think than merely changing one currency for another – especially when the fundamentals for that currency would, almost by definition, have even less-concrete basis than what it would seek to replace. I’d really like to explore these ideas in more depth with others, so I’d be very happy to toss them into the good-lookin’ stew we seem to be brewing here. Any suggested place to meet up, and get cookin’? Just to put some markers on the table, I see it differently. Two books that inform the way I see it are Marx’s Revenge and The Ascent of Money. “there are no rules” Rules are the essence of civilization. As they evolve they create a reasonable expectation of going forward behavior. In a “state of nature” there is only one rule, eat or kill. As civilization (organizations) evolve the rules allow more flexible behavior. When the world changes radically legacy rules have to change to allow new behaviors to emerge. “there are no rights” The same story as rules. Rights are similar to standards in emerging complex systems. “money doesn’t matter” Money is a symbolic method of representing time. As a symbol it allows us to invest past time to earn more future time. The complication is that money can also take on it’s own life separate from it’s role as an exchangeable representation of time. It would be very cool to find the right place to continue the convo. @Michael – “There is only one rule, eat or kill”. Hmm. Sounds very Darwinian to me – kind of the exact inverse of social, in fact. I kinda prefer Kropotkin – another naturalist, around the same time as Darwin, who studied much more severe environments (Siberia, to be precise). Came up with the opposite conclusion, otherwise known as ‘mutual aid’. Which could equally argued to be ‘the natural state’ – and in a social context, perhaps ‘the only rule’? There is a strong foundation in this document. Many years of experience and the input of many smart people started this. The value of accessing the right knowledge assets (capital) applied to any given problem, any new innovation or market opportunity is increased productivity. People are the “containers” of knowledge. Being able to create a knowledge inventory accessible to everyone enables everyone to increase productivity. Doing so would fuel a new economy based on a new currency and everyone could become their own “knowledge corporation”. Shoot it down or move it forward. My take on this comes from the work of Alvin Gouldner who published a paper in 1960 in the American Sociological Review called “The Norm of Reciprocity: A Preliminary Statement” http://www.jstor.org/pss/2092623. He later wrote a paper on the Importance of Giving Something for Nothing where he outlined the Norm of Beneficence to complete his initial thoughts on reciprocity. These two norms regulate the human relationships involved in social capital: the norm of reciprocity (that one returns kindness) and the norm of beneficence (that one gives something for nothing when possible). Without the latter social capital doesn’t get started. Without the former it doesn’t grow. The two work together over time as trust deepens. Don’t know if this makes sense in this overall thread but thought I’d share the thought. .. is pretty much the same point in the concluding 7 or so paragraphs of a seminal 1999 article by Peter Drucker in the Atlantic Monthly titled “Beyond The Information Revolution”. After 15 years of helping organizations build hierarchies when I was with Hay Management Consultants, 25 years of systems thinking and org behaviour studies (and all the attendant stuff I learned and worked on re: management methods, compensation, performance mgt, leadership & mgt dev), and then 5 years of paying attention to the Web … the day after I read the paragraph you cite above, the concept of “wired + archy” (= wirearchy) popped into my head. Knowledge workers are increasingly aware that THEY own the means of production of economic value .. imagination, knowledge, purpose, creativity, etc. … and guess what, now more and more of them everyday are interconnected. Whether this is more about social capital, that we have invested in the relationships we develop and the reputation that may derive from it or whether it’s about social capitalism, as an inclusive economic paradigm. Here for example from the 1996 P-CED paper which proposed a new inclusive economic paradigm which could it suggested by catalysed by deploying social capital made available by the dawning information age. The core argument for this paradigm was an assertion that Western capitalism had allowed numbers to trump people, rendering them disposable in favour of profit. The message seems to have got diluted somewhere with all the talk of a relationship economy, until perhaps being confronted with the credit crisis of 2008, when many began to realise that we’d taken our eye off the ball. As the link above to Wikipedia illustrates, it was in the wake of an earlier economic collapse in Russia that offered the opportunity to demonstrate this model of social capitalism. A crisis which had been brought about by failing to understand the need for capitalism to co-exist with democratic governance, which could be considered as social capital. The story had been brought to light by David Mclintick’s article “How Harvard Lost Russia” which inspires little confidence in what they might have to say now. Thanks, Leonard. Yes, saw it about 10 months ago. Good article. Karen Stephenson knows her stuff, and she got my hero Charles Handy to comment … good on her. I like believing that wirearchy is a bit more apt of a term than heterarchy, which still (to me) implies some degree more of static-ness than I think will be the case, and it’s a bit more awkward and academic-y. And, it does not “poke fun” at traditional hierarchy by rhyming …. Thank you and I will, I write on average two articles per week provide my workload allows me to! Despite this, the majority of school failures are Right Brain Dominant. The party will give pension to all the farmers who have attained the age of 65 years. important documents and submit it with the court. else having identical RSS issues? Anyone who knows the solution can you kindly respond?